I have heard that there is now a three yearly vaccination available for dogs. 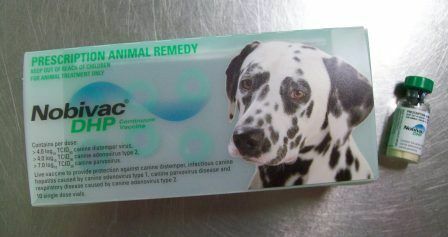 Is this a better vaccination to use than the yearly one that I currently give my dogs? Why do we need to give so many vaccinations anyway and doesn’t over vaccinating dogs cause diseases? TRIENNIAL VACCINES? Vaccinations are currently a hot topic and the Australian Veterinary Association’s (AVA) recent statement supporting the use of triennial vaccines (given every three years) does unfortunately have some opposition amongst vets. It’s a complicated discussion and I’ll give you my opinion but would add that you should listen to your own vet’s views before making any decision to change your vaccination schedule. Firstly, there is no proven link between vaccinations and the onset of immune mediated and other diseases as you may read on the internet. Vets are using triennial vaccines simply because they are now registered in Australia and there is overwhelming evidence that dogs are adequately protected with these vaccines that have been available overseas for many years, not because there is a link between vaccination and the development of other diseases. Although there is no proven link between development of various immune mediated diseases and routine vaccinations, it wouldn’t surprise me if some were discovered in the years to come. However, in my view the risk of consequences due to not vaccinating far outweigh the minute risk of developing other diseases. The veterinary profession is steadily getting better at diagnosing relatively rare immune mediated diseases that would have been missed in the past and so what some people on the internet claim is an epidemic of disease and blaming it on vaccinations could just as illogically be blamed on heartworm preventatives, flea treatments, commercial pet foods and fluoride in the water! Triennial vaccines are only available in the C3/DHP form. These are the life threatening ‘core’ viral diseases that all dogs should be vaccinated against; Distemper, Canine Hepatitis and Parvovirus. Unfortunately they are not available against the causes of Kennel Cough (a.k.a Canine Cough). WHAT COURSE OF VACCINATIONS SHOULD I USE? Regardless of whether you use a registered triennial vaccine or the more commonly used annual brands of C3 vaccine the following applies. All pups require at least a C3 vaccination at 8 weeks and 12 weeks of age. Some vaccines are registered to be used from 6 weeks of age but most aren’t. It is only several days after the 12 week vaccination that you can consider the pup as ‘fully protected’ and so allow it out for walks in the local park. This is where it becomes complicated because there are some annual brands of C3 vaccine that actually require another booster at 16 weeks of age and several days after that we consider the pup as ‘fully protected’. You’ll need to consult your vet as to what brand of vaccine they are using. A recent seminar I attended had two veterinary specialists recommending that pups receive a 16 week vaccine booster in addition to the 8 and 12 week vaccinations even if the vet is using a vaccine registered as offering full protection after the 12 week vaccination. This is regardless of breed. Many vets have always recommended a 16 week vaccine booster for breeds commonly thought to have trouble responding well to vaccines such as Rottweilers and Dobermanns. The specialists I listened to held the view which is shared by most vets, myself included, of then recommending a booster vaccine a year later (i.e. at 15 to 16 months of age). This is regardless of whether a triennial registered vaccine is used or not at the initial puppy vaccinations. However, the manufacturers of the triennial vaccines recommend the next booster to be given in three years time and then every three years after that, hence the description of ‘triennial’. After the 15 to 16 month of age vaccine then you proceed with boosters every three years if you are giving a registered C3 triennial vaccine, otherwise you need annual C3 boosters. KENNEL COUGH? I regard Kennel Cough vaccination as optional but especially recommend it when the dog is going to visit boarding kennels (most kennels won’t accept dogs without Kennel/Canine Cough vaccination), grooming salons, clubs and shows. There are injectable Kennel Cough vaccines against the main causes of Kennel Cough, Parainfluenza virus and Bordetella bacteria which sometimes can be administered in the same syringe as the C3 vaccine. These vaccines need two initial doses that are typically given with the C3 vaccines at 8 and 12 weeks of age (C3 plus a Parainfluenza vaccine = C4, plus a Bordetella vaccine becomes a C5). Then Kennel Cough requires booster vaccinations yearly. There are also very good intranasal vaccines which are squirted down the dog’s nose, that cover either Bordetella alone or in combination with Parainfluenza, that require only a single initial dose and then yearly boosters. These intranasal vaccines probably provide a better protection but are controversial in that they will cause the dog or puppy to suffer a mild case of Kennel Cough in about 5% of cases which usually doesn’t require treatment. However, some vets will avoid using these vaccines in brachycephalic breeds because these short nosed breeds seem to be more affected if they do develop this complication. I’ve used intranasal vaccines on my Griffons without any problems but I wouldn’t criticise a vet or owner if they opted not to use an intranasal vaccine. I don’t use them on Pugs! Some vets use a Kennel Cough vaccine that includes protection against a relatively rare cause of Kennel Cough, Adenovirus type 2. So, even if you and your vet use a triennial C3 vaccine every third year, you still need to give a Kennel Cough booster vaccination yearly to ensure good protection against this disease. FULLY PROTECTED? You may have noticed that I used italics for the term ‘fully protected’ earlier. This is because ‘fully protected’ doesn’t mean that every pup is fully protected because some will never respond adequately to vaccination even if they were given further boosters. It means that virtually all pups will be immune to those diseases covered by the vaccine. Triennial and annual registered vaccines seem to have much the same degree of success in providing protection against the core diseases, close to 100%. Kennel Cough vaccination is more like 90% effective mainly because there are actually several less common causes of the disease for which vaccines aren’t available. CORONAVIRUS VACCINATION. Your vet may offer a vaccine against Coronavirus to be given at 8 and 12 weeks. I would recommend that you consider giving it because Coronavirus is frequent cause of puppy gastroenteritis that does significantly increase the mortality rate of pups that have concurrently contracted Parvovirus. It is only recommended for the initial puppy vaccinations and it is not considered necessary to provide further boosters. Unfortunately it is available currently in Australia only in combination with a Leptospirosis vaccine which isn’t really a common disease warranting vaccination for most breeders. ANTIBODY TITRE TESTING. You may see advertisements for antibody titre testing. This is where a blood sample is taken from your dog and it is tested to see if they have adequate antibodies against the diseases in the C3 vaccine for example. If the antibodies are adequate then the argument is that vaccination is not necessary. These tests are of varying quality and are often more costly than just providing the vaccine anyway. Although as a vet I know that the notion of causing diseases through ‘over vaccination’ is unproven, I along with most other vets feel that the availability of a safe vaccine for the very real and life threatening core viral diseases that is given every third year should alleviate concerns pet owners may have about ‘over vaccination’ and decrease the risk of other immune mediated diseases occurring if such a link is discovered in the future. Choosing to run antibody titre tests instead of vaccinating seems nonsensical to me. You are waiting for your pets’ immunity against Parvovirus for instance, to drop to a level where their life is threatened if they are exposed to a virus that is extremely common in the environment. Why take the risk? Remember that it isn’t just dogs that harbour Parvovirus but also cats, particularly stray and feral cats that carry and excrete canine parvovirus in their faeces. Every year you’ll read in the newspaper about a ‘parvo’ outbreak somewhere. There is no such thing as a parvovirus outbreak. Parvovirus is everywhere, all the time. We would all regularly walk it into our homes on our shoes. What happens instead are outbreaks of people not completing a course of vaccinations in their new pet or continuing regular boosters and their puppy or adult dog suffers the consequences. WHY DO PUPPIES REQUIRE MULTIPLE VACCINATIONS? Why a course of vaccines rather than just a single dose and then yearly or triennial boosters? All pups receive antibodies (known as maternal antibodies) against diseases from their mother both via the placenta but mainly via the colostrum they drink over the first 48 hours after their birth. These antibodies will protect the young pup against those diseases normally covered by the vaccines for their first several weeks of life assuming their mother has been adequately vaccinated. However, maternal antibodies gradually disappear due to dilution as the pup grows bigger, being broken down by their metabolism or perhaps in some cases because they have actually been used in fighting an infection. The puppy can’t replace these antibodies as they disappear and rely on their own immune system to produce antibodies after being challenged with a vaccine containing killed or attenuated live virus or bacteria. Killed (inactivated) and attenuated live vaccines can’t produce clinically significant disease but will stimulate the immune system to produce antibodies that will fight the ‘wild’ viruses or bacteria that are in the animal population. The crunch is that if a vaccine is given while the pup has lots of maternal antibodies then these antibodies swamp the vaccine viral or bacterial particles and don’t allow it to be presented to the pup’s immune system to trigger a protective response. Similarly, if we wait too long before giving a vaccination then the pup may catch the disease when it doesn’t any longer have enough protective maternal antibodies and its immune system can be overwhelmed and possibly lead to death. We know that at about 8 weeks of age most pups will respond to a vaccination but some won’t because of high levels of maternal antibodies persisting in their bloodstream. We know that virtually all pups by the age of 12 weeks will respond to a second vaccination if they hadn’t already been protected by the first. That’s why we tell you to keep pups relatively isolated or at least avoid public places where wild Parvovirus for example may be found until at least a week after the 12 week vaccination. As I said earlier, some vaccines are registered as requiring a third booster at 16 weeks of age and some specialist veterinarians recommend a 16 week vaccination anyway, regardless of what brand of C3 vaccine is used. We have all heard about pups falling ill to say Parvovirus shortly after receiving a vaccine. The vaccine doesn’t cause the disease, instead the pup had already contracted the disease and was either incubating the infection before being able to adequately respond to vaccination or just wasn’t going to respond to the vaccination because of persisting maternal antibodies that weren’t adequately protective against the more virulent wild virus either. So, please do complete the puppy vaccinations to at least 12 weeks of age and then a booster a year later. I do recommend using the triennial vaccines for these vaccinations and then every third year even though the manufacturer may regard the first yearly booster as unnecessary. The Kennel Cough vaccine is not quite as important although it must be given if the dog is going to visit boarding kennels. I do recommend the Coronavirus vaccination for pups only. I believe antibody titre testing to be a waste of money and unnecessary so long as you keep up vaccinations up to date. Very occasionally if a dog has had a rare reaction to a vaccine, you may consider running an antibody titre test to check if the next vaccination might possibly be missed.